The invasion of Crete revealed for the first time the use by the Germans of the motorcycle tractor for the purpose of hauling light, single-axle, open trailers or light guns. 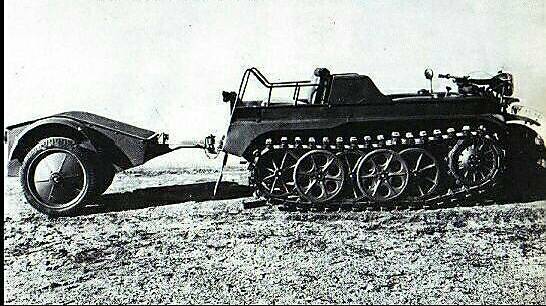 This tractor is known to be employed in the Middle East and, according to recent newspaper accounts, it is now to be seen on the Eastern Front. 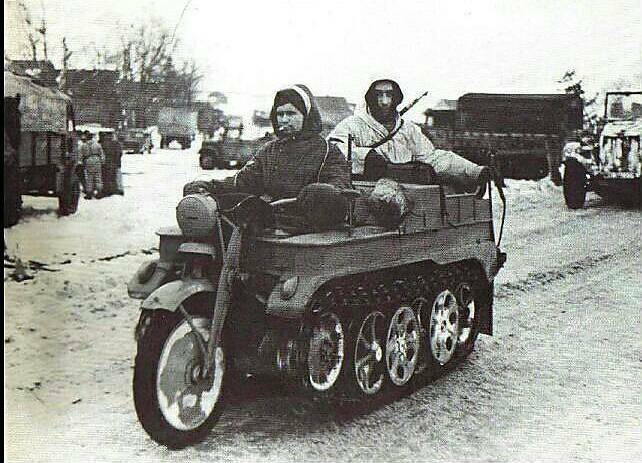 It is a suitable vehicle for accompanying airborne troops. 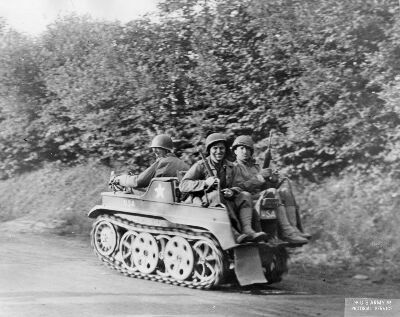 Early in 1941, it was accepted as an army vehicle and received the number Sd.Kfz. 2 (Sonder Kraftfahrzug--special motor vehicle). The accompanying sketches show that the body (1) is a box-like structure made of pressed metal in two halves, and joined along a horizontal plane below the track-guards (2). It contains the driving position (3), the engine (4) and transmission, and a transverse seat (5) at the rear over the cooling system (6). The driver is seated on a saddle (7) mounted above the gearbox (8) and clutch housing (9), and has two rubber knee-pads fitted beneath the dashboard. On each side, the track-guards carry gasoline tanks (10) at the front while, level with the engine, the sides are built up (11) and contain on the left the tool kit and on the right the battery and fuze panel. At each side of the passenger seat there is a light rail (12), while foot rests, rifle rests (14), and clips (15) are provided at the rear. The power unit (4) is an Opel "Olympia model 38," gasoline engine, mounted towards the rear of the body. It is a four-cycle, four-cylinder unit developing about 36 brake horse power at 3,400 rpm. The engine body is in two main parts: the cylinder head, and the cylinder block and crankcase (both in one piece). This is supported in four main bearings. The pistons are of light metal and are fitted with two compression and one oil-scraper rings. The wrist or piston pins are full floating and are prevented from sideward movement by locking rings on each side. The overhead valves (one intake and one exhaust for each cylinder) are operated by pushrods and rockers from the camshaft, which is mounted in four bearings in the crankcase. The gasoline pump, tachometer, oil pump, and distributor are all driven from the camshaft. An impeller-type water pump, together with the generator, is driven from a master pulley on the free end of the crankshaft and circulates water between the engine and the radiator (6), which is located at the rear of the vehicle. A small water tank is mounted above the pump. The laminated radiator is built in a large airduct (16), in which there is a fan (17) driven direct from the crankshaft. The rear end of the airduct may be closed by a flap (18) operated by a hand lever on the left of the driver. Oil is pressure-circulated by a gear pump from the sump through a strainer and passes through the bearings of the crankshaft, connecting rods, camshaft, tappets, and valve rockers at a pressure of 30 to 45 pounds per square inch. Piston pins and cylinder walls are splash-lubricated. In order that the oil pressure may not rise too high, there is an excess-pressure valve in the wall of the oil pump, and this returns some of the oil to the sump. An oil cleaner of the metal-disk type is fitted. This is itself cleaned by turning the ratchet on the top. An Opel downdraft carburetor, with a large oil-bath-type air filter (19) on the air intake, is fitted. Gas is drawn from the tanks (of which there are two, each holding 5.5 U.S. gallons) and fed to the carburetor by a mechanical diaphragm pump of normal design, which is driven from the camshaft. Ignition is by Bosch coil and distributor, the latter being driven from the camshaft. A Bosch 75-watt generator, with voltage regulator, is mounted on the right side of the engine and together with the water pump is driven by a V-belt from the master pulley. A Bosch starter motor is also fitted on the right side. The 6-volt battery is mounted on the right side above the track-guard. Normally the engine is started by a self-starter controlled by a pull-knob on the dashboard. A crank is also provided and, for use, is inserted in an opening in the radiator grill at the back of the vehicle (just above the trailer coupling) and pushed through to engage with the crankshaft. Transmission is through an Opel multiple-spring, single dry-plate clutch, mounted on the flywheel, to a 3-speed-and-reverse gearbox (8), which also incorporates an auxiliary gear box, giving high and low ratios so that in effect 6 forward speeds may be obtained. A long gear-shift lever (20), held near the top in a gate (the H-shaped aperture in which the gear lever operates) on the dashboard in front of the driver, gives the main gear selection, while a shorter lever (21), to the rear of the first, gives selection of high and low ratios for road or cross-country travel. A hinged latch which covers the "reverse" part of the gate prevents accidental engaging of that gear, while an extension of the latch beyond the hinge makes its removal an easy matter. The vehicle must be stationary while changing ratio in the auxiliary gearbox. The speedometer is driven from the gearbox. The differential (22) is of the controlled spur-gear type and incorporates two steering brakes (23), one for each track. These are internal expanding, and in order to increase their braking efficiency the drums are not directly fastened to the axle shafts, but are driven at considerably greater speed from the differential spur pinions through a set of gears. From the differential, the drive passes through the steering brakes (23) and metal couplings (24) to the final reduction gears (25), and thence to the sprockets (26). Each sprocket is a narrow twin-rimmed wheel, of which the inner and outer rims are shod with rubber pads (27) (12 per rim) to form a continuous tire. The pads have the same inside curvature as the rim, but are flat outside. Adjustable rollers (28) (12 per sprocket) are fitted between the rims to act as teeth and to engage the track. An internal expanding brake, which is foot operated, is mounted inside each sprocket. The front wheel (29) is a pressed-steel disk type with a 3.5- by 19-inch tire (tire pressure 34 lbs. per sq. in.) and mounted in a pressed steel, motorcycle front-wheel fork (30) of conventional pattern. 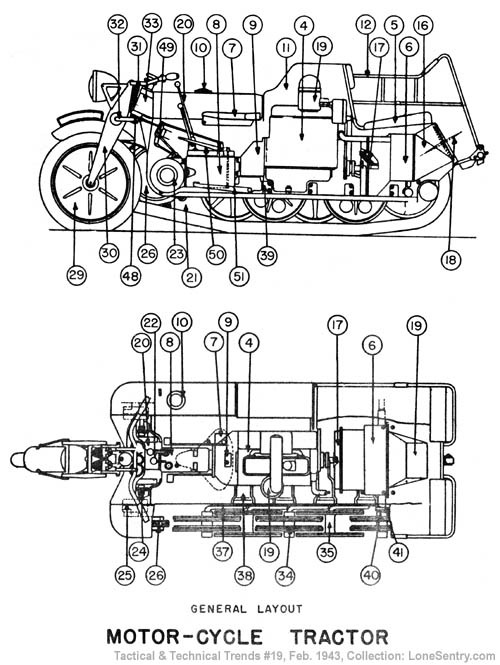 The springing (two vertical coil springs) (31), with controllable friction-disk shock absorbers (32), and the steering column (33) are very similar to those of a normal motorcycle. 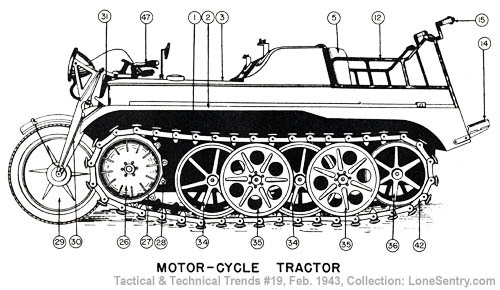 The track assembly, which is of the usual type for half-track vehicles, consists on each side of a driving sprocket (26), four equal size, double-rimmed bogie wheels (34 and 35), and an idler wheel (36). Of the bogie wheels, the odd numbers (34) (from the front) are narrow wheels with radial spokes, while the even numbers are wider, pressed-steel disk wheels. The former run between the rims of the latter, the whole bogie and idler system being set rim to axle. The bogie wheels are mounted on bell cranks (37) fastened to torsion bars, which pass across the body of the vehicle in crosstubes (33) of circular section and are anchored in the opposite side. The torsion bars of the corresponding bogie wheels of the two sides are carried one above the other (39) in the same cross tube. The idler is simply another narrow-rimmed bogie wheel and is carried on an eccentric arm (40) which can be adjusted by a screw rod (41) passing through a bracket on the body. By this means the position of the idler can be varied, and hence the track tension may be adjusted. The bogie and idler wheel rims have thin, solid rubber tires. There are no return rollers, the track returning along the tops of the bogie wheels. Each track is made up of 40 forged steel links (42) (fig. 1) joined together by a bolt (43). These link joints are lubricated from oil chambers (44) which also, in part, form the tongues of the track links and pass between the rims of the bogie wheels. Above the oil chambers and track bolts, rubber shoes (45) are mounted. These are easily replaceable, being retained by 4 screws (46) only. The motorcycle tractor is steered by the front wheel, by handlebars (47) in the normal manner of a motorcycle, and for sharp turns, by the steering brakes, operating on the tracks. Two take-off rings (48) at the bottom of the steering column are connected by rods to arms on the brake crosstube (49). These in turn actuate levers, the ends of which are joined by means of adjustable rods to the steering brakes (23). The steering brakes come into play for turns of over 5°, corresponding to a movement in either direction of about 1 3/4 inches at the ends of the handlebars. The footbrake, which is located on the right, and the handbrake (50) both operate an internal expanding brake mounted in each sprocket. together with starter button, ignition and lighting switches, tachometer, speedometer, odometer, oil-pressure gauge, and water-temperature gauge. 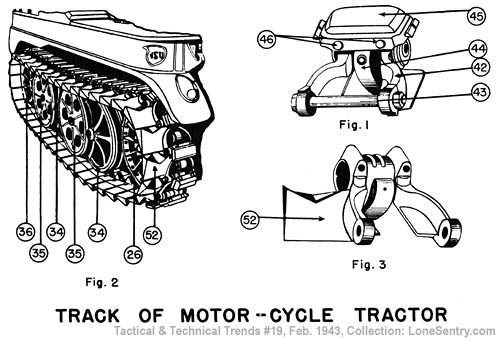 A German document details several modifications which are made to the motorcycle tractor to fit it for use under tropical conditions. The oil filler cap has a linen hood tied over it, and the breather pipe has a steel-wool filter held between two pins near the bottom. For cleaning purposes, the filter may be removed after the lower pin has been extracted. In order to provide sufficient cooling, the fan is driven at 1.4 times the crankshaft speed. The Opel carburetor is replaced by a Solex model, believed to be of the duplex downdraft type. A filter is incorporated between the gas tanks and the pump. The "Knecht Tornado" air filter fitted to the normal vehicle is replaced by a similar type of oilbath filter, incorporating a mechanical precipitator on the inlet side. A new generator is fitted, while a solenoid-operated starter motor replaces the mechanically-operated type fitted in the normal model. The starter push button is located on the right side of the body level with the driver's seat. The distributor is enveloped in a linen bag. Both main and auxiliary gear levers have linen hoods tied to them to cover their points of entry into the gearboxes. The breather holes in the gearboxes, the steering brakes, and the stub axle housings are all covered with cloth hoods. For special purposes, tracks in which the links have extension plates (52) welded to their outside (figs. 2 & 3) are provided. These are probably for use in very loose sand or swampy ground. The covers of the track brakes have extension plates welded to the upper halves to prevent the entry of sand as much as possible. The throttle twist grip is covered with a linen sheath which is tied to the grip at each end and to the handlebars, with sufficient free cloth allowed between these fastenings to permit full movement of the twist grip. A 0.4-gallon container for distilled water, and a gallon tank for radiator water are fitted. A length of wire (16 to 20 feet) and a 13- by 16-foot tarpaulin complete the special tropical equipment of the motorcycle tractor. este es un excelente grado de conservación aquí en Italia. Se encuentra sin restaurar Massimo? Cual es la historia de esa Kettenkrad? El anhanger es es mismo que se observa en las Zundapp y BMW 750 cc? Gracias por subir la fotografia! El semioruga tiene la pintada la palabra achtung! Estara configurado como Vehiculo Capturado? Gracie Massimo, come me fai lavoraré!! orso 19 escribió: esempio "A" company avevano soprannomi che iniziavano con la lettera A come Anne , Annabelle ecc. "B" company Belle, Betty Brass-city ecc. "C" company Charly, Coconut, ecc. "D" company Dave, Diamond, ecc. Il codice radio del mio Halftrack M16 Achtung!, lo ho copiato da una foto originale del signal corps dove si vedono diversi halftrack che stanno entrando in una città tedesca, e quello in primo piano ha la scritta ACHTUNG! Con respecto a la palabra ACHTUNG en el semioruga , la misma se pinto por que vio en una foto de epoca de tropas americanas ya en Alemania, con esa descripcion. Se entiende mejor en Italiano, no?? Massimo, esta informacion te obliga a armar un post nuevo de tu semioruga!! Más fotos! orso 19 escribió: La storia di questo Kettenkrad che io conosco è questa: è stato comprato anni fa ad un mercato internazionale di ricambi e auto d'epoca che si svolge ogni anno all'interno del circuito di IMOLA, dove si correva la Formula 1. Il suo prezzo per i tempi era altissimo, ma se vediamo i prezzi attuali di questi mezzi, è stato un affare! Il bello è che era tutto verniciato con l' olive drab ed aveva ancora le insegne della 34° Division Red Bull, utilizzato come preda bellica. Il nuovo propietario, essendo un restauratore di affreschi e di quadri antichi, ha utilizzato le stesse tecniche e in sei mesi ha tolto millimetro dopo millimetro la vernice OD facendo riaffiorare la sua vernice originale color sabbia. La partticolarità del rimorchio invece è quella di avere le ruote completamente in ferro, senza i pneumatici. El Kettenkrad se compro años atras en una feria de autos de epoca que se hace en el autodromo de Imola. El precio en esa epoca fue altisimo, pero pensandolo ahora hubiese sido un buena compra! Estaba pintado todo de verde oliba y con las insignias de la 34° Division Red Bull como presa de guerra. El nuevo propietario, al ser un restaurador de frescos y pinturas antiguas, ha utilizado las mismas técnicas y en seis meses se ha eliminado la pintura milímetro a milímetro OD para hacer resurgir su color arena de la pintura originales. orso 19 escribió: Mariano muy bien! Sono un traduttore che si fa pagare a caro prezzo per i servizi! perfecto, coctratado, las Liras son fuera de curso!!!!! Es un vehiculo muy ingenioso, a medida que los usaban debieron ir haciendo ajustes como por ejemplo las orquillas ya que, las primeras orquillas se rompian facilmente. Otro inconveniente que tenian eran las perdidas de aceite. En total se habrian fabricado mas de 8000 unidades.